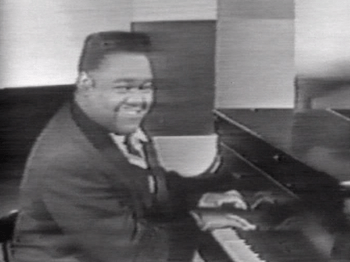 “Ain’t That a Shame” is a song written by Fats Domino and Dave Bartholomew. Released by Imperial Records in 1955, the song was a hit for Domino, eventually selling a million copies. It reached #1 on the “Black Singles” chart and #10 on the “Pop Singles” chart. The song is ranked #438 on the Rolling Stone magazine‘s list of The 500 Greatest Songs of All Time. The song gained national fame after being re-recorded by white recording artist Pat Boone. Domino’s version soon became more popular, bringing Domino’s music to the mass market a half dozen years after his first major recording, “The Fat Man“. 12 Aug	This entry was published on August 12, 2014 at 9:39 am. It’s filed under Music Video, Video and tagged Ain't That a Shame, Billboard Hot 100, Dave Bartholomew, Domino, Fat Man, Fats Domino, Imperial Records, Pat Boone. Bookmark the permalink. Follow any comments here with the RSS feed for this post.